Tablets require special attention when it comes to shipping. At DS Smith, we have developed a range of retention packs with e-retailer's specific needs in mind. Browse our range of size options to find the perfect match. Our all-in-one design helps ensure a high-level protection for tablets during transit. Electronic tablets need protective packaging during shipment, not only to immobilise them but also to provide space around them to avoid movement and shocks. 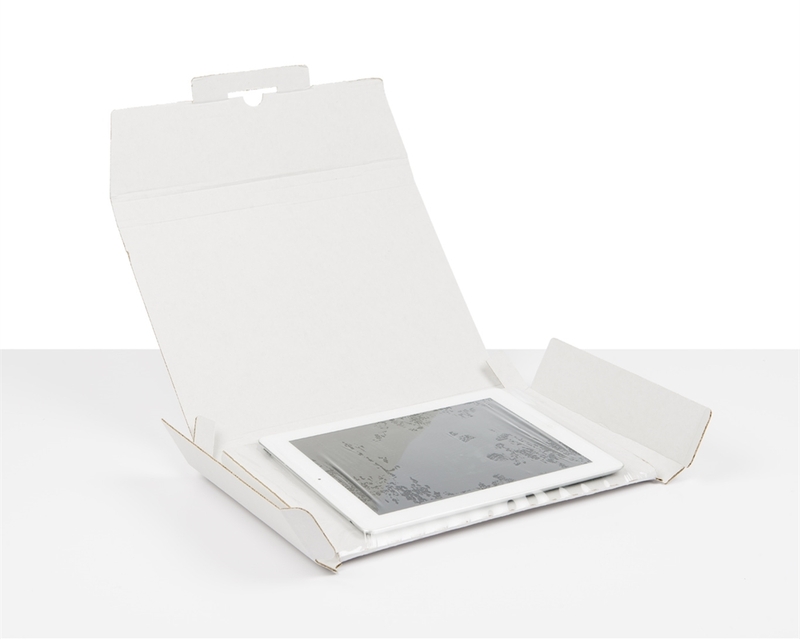 Our retention pack for electronic tablets, made from micro-flute cardboard and stretch film, offers a complete protection at once. Our smart retention pack for tablets provides a unique one-piece solution for protecting your product. It helps you save money and space by getting rid of void fill and packing tape. Our retention pack for tablets is a smart solution for tablet resale or refurbishment businesses. The flexible stretch film is designed to fit various sizes, enabling you to use the same box for different tablet models. Pack each device in a matter of seconds, close the box with our convenient glue strip and rest assured that it will arrive in perfect condition.